This was a fast-paced story that I truly enjoyed. With a few minor details that bugged me about the female protagonist, the experience was great for me and I'm glad I finally picked up a story written by Carmack. 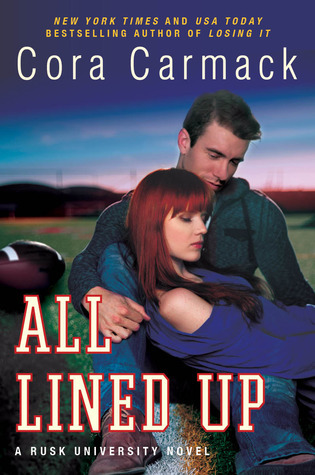 All Lined Up really delivered a realistic portrayal of college kids trying to figure out their lives. I liked that the story's told in alternating POVs so that readers can get inside the head of both Dallas and Carson. Let's start with the latter because I really liked him and had no issues with him at all. Carson was...how to say it....a sweetheart. I liked how supportive, hard-working, and ambitious he was. He knew what he wanted and he went for it. I liked the fact that as much as he had feelings for Dallas, initially he was willing to suppress that for her sake and for trying to stay focus on his goal. And when their feelings for each other proved to be too strong to fight, it was wonderful seeing how much he wanted to make things work while trying to make her feel comfortable with however she wanted the relationship to be. Carson really catered to Dallas' needs throughout the story and he was impeccably lovable. This is the kind of boyfriend girls should have. Speaking of Dallas' father, he was a good character. A great coach too, and as much as Dallas goes on about him, I didn't get the sense that he was as fearful as she made him out to be. He seemed like a nice enough man and he wasn't even too hard on Carson, even when he found out about their relationship. Other characters I liked were Stella (love the inclusion of diversity because it adds variety). She was a cool, fun friend. Just hated that she wanted to hook up with a slime like Silas even though he wanted to hook up with Dallas. Well, whatever, that's her I guess. And oh, I liked Carson's friend, Ryan. I wish we got a lot more of him in the story and hopefully he'll be included a lot more, as in play out an interesting story surrounding him in the next installment. Overall, it was an enjoyable read. I liked that this is a series and we get to experience more of this exciting college life of two interesting characters. Definitely going to stick with it to discover how their lives take off from here on out. this does sound really good! thanks for the great review! Thanks for stopping by. Hope you like it too. I have a copy of this, but can't really get worked up to read it. I don't know why bc readers seem to really like it. Was it annoying that all the guys wanted Dallas? Thanks for the reviews, Shane. I'm glad you enjoyed! it wasn't so much about being annoyed that they all wanted her, but it was more about that they weren't respectful. I don't want to spoil it but when they were talking about her in the locker just turned me off. I love Cormack's other books, but I haven't read this one yet. I'm glad that you enjoyed it! I'm glad you liked this one! I have heard so many good things about it. It's great to find a good, quick read, and it sounds like Dallas didn't ruin this book for you, which is great! I loved this one. Stella!!! And I'm curious to see how she redeems "slimy" Silas in the next book!